Inside we pack a number of small cheap toys or activities and at intervals throughout the trip (normally every 20 min to half an hour) the boys get to pick something out of their bag if they are being good. We’ll include things like a magazine, a little colouring pad and crayons, a set of stickers, stocking filler type stuff that will hold their interest because it’s new but doesn’t matter too much if it gets lost or broken. These have been an absolute life saver and we also adapted the same theory when I took the boys to Seattle last year. The boys really look forward to them as a treat and it means we always start the journey off excited and in a good mood so we’ve got the best possible chance of making it to our destination without anyone having a meltdown (me included). Don’t scrimp on snack and drinks – Even if you’re not travelling over a meal time bring plenty of snacks just in case. I like to take a combination of raisins, mini kids biscuits and some chopped up vegetables, split up into lots of little pots. That way they can easily be spaced out and they are never holding too many at once so when one lot inevitably gets dropped it’s no big deal. The same goes for drinks. Smaller bottles or pouches with sports type tops reduce the risk of spills. Develop some games to pass the time – Favourites in our car have been a sort of scavenger hunt where the boys have to look out for certain things (lorries, cows, helicopters) along the way or a variation where we assign noises to different things so they have to clap when we go over a bridge or blow a raspberry when we stop at a traffic light. Ditch the radio – Get some kids CDs of music or nursery rhymes. It’s hard to moan and bicker when they’re singing! You can never have too many strategies for making car journeys fun so I’d love it if you’d share some of your own tips. How do you survive long car journeys? For assistance on faster modes of car payments visit wowloans neart me. We do the little bags too for long journeys, and as a last resort we opt for the iPad, which is a massive treat as she doesn’t get to use it much – only when we need a distraction, such as long journeys! 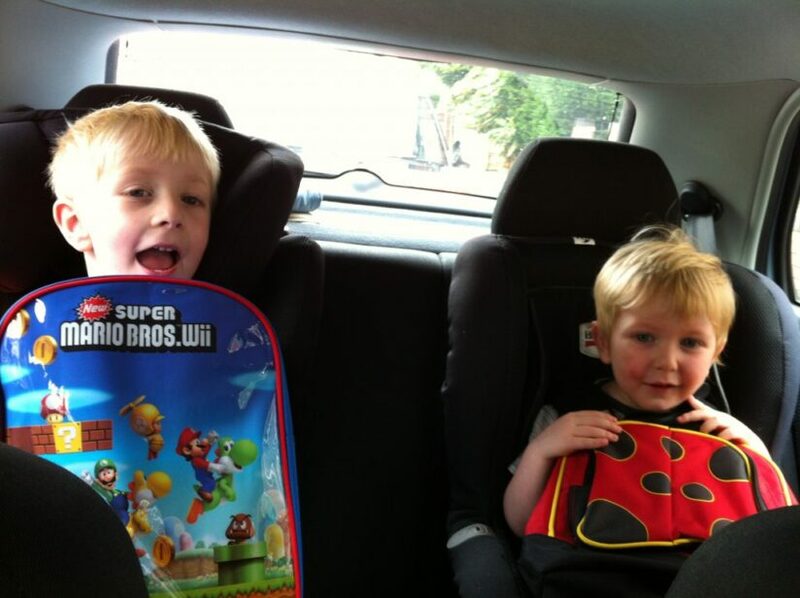 The boys live their kindles too, great for long trips. We enjoy playing the number plate game and giving cars names using the last three letters of the number plate. It can come up with some quite funny names which keep us giggling on long drives. They do make a great difference, don’t they! This is one thing we don’t have to worry about with Amy. I remember our trip from Bristol to Germany last year. I was absolutely dreading it, but Amy was as happy as they come from 4.30 in the morning until 22:00 at night. She didn’t moan once and just kept herself entertained with books, her doll or looking out of the window while I slept almost the entire trip 😀 She would undoubtedly love a treat bag though. I mean who wouldn’t? We also play the yes/no game (when you can’t answer any questions with yes or no). The kids love it and it also helps develop their vocabulary. Oh you are very good! Each of my boys has a ds and we have dvd players. We do play eye spy and spot how many certain coloured vehicles there are. Hello Cat, really nice post you have here. Traveling with your kids on a vacation can create wonderful memories for both you and your child. You have to make sure that your vacation is well planned and that you come well prepared is the easiest way to guarantee both you & your kids have fun. Even the best attractions can turn out to be a dud for your kids. Bringing alone toys your child knows & loves will prevent the need to go running to find alternatives for your child once he gets bored and even the best vacation can turn into a nightmare if you don’t guard your kid’s safety which is now easily achieved with a couple of child safety measures. Taking care of your kid’s comfort while traveling will reward you with a happier, less cranky & more cooperative child. Traveling with kids means traveling with a lot of gear. Choosing your gear wisely means having gear that is easy to carry & handle as well as a more relaxed and enjoyable trip. Some great ideas here cat i love car games !